↑ "The Plant List: A Working List of All Plant Species". http://www.theplantlist.org/tpl1.1/record/kew-137105। আহৰণ কৰা হৈছে: 13 January 2015. ↑ 2.0 2.1 Staples, George; Michael S. Kristiansen (1999). Ethnic Culinary Herbs. University of Hawaii Press. পৃষ্ঠা. 73. ISBN 978-0-8248-2094-7. ↑ 3.0 3.1 Staples, George; Michael S. Kristiansen (1999). 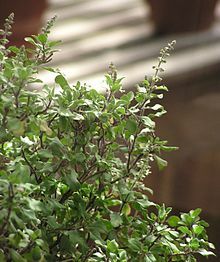 Ethnic Culinary Herbs. University of Hawaii Press. পৃষ্ঠা. 73. ISBN 978-0-8248-2094-7. ↑ Staples, George; Michael S. Kristiansen (1999). Ethnic Culinary Herbs. University of Hawaii Press. পৃষ্ঠা. 73. ISBN 978-0-8248-2094-7.